Interesting Times is a curiously feeble title for an autobiography, rather as if Noam Chomsky were to write an article called "Could America Do Better?" It carries, of course, the sting of an ominous Chinese saying in its tail; ironic English understatement. "I have lived," Eric Hobsbawm remarks, "through almost all of the most extraordinary and terrible century in human history"; but he has lived through it as one of that century’s most eminent Marxist historians, and the dispassionate gaze of the historian is reflected in his title. Gleaning one’s history from a man who can remember celebrating the centenary of Beethoven’s death at school is rather like being instructed in one’s religious duties by the Pope. Hobsbawm has also clapped eyes on Stalin, though the dictator was admittedly a corpse at the time of their encounter. Like most autobiographies, this one will do well in Eric Hobsbawm’s England–not because the English love a Marxist but because they love a character. From Dr. Johnson to Winston Churchill, it is the idiosyncratic individual who stirs their imagination, not some unpalatably abstract truth. This is why they love a lord as well as a character, and Oscar Wilde did his best to be both. They love a lord not only because they are cravenly deferential but because they are also anarchic and bloody-minded, and aristocrats are those who are most cavalier about convention. In this sense, the autobiography is a covertly anti-intellectual genre, designed for those who are more interested in what Tolstoy had for breakfast than what he thought about Plato. It is also a self-contradictory one. Autobiographies set out to capture the uniqueness of the individual life, but find themselves telling the same old story. Everyone has to be born, have parents, get educated, discover sexuality, launch a career and the like. It is biology that lies at the root of biography. And biology is no respecter of individuals. It is also no friend of humility. However modest the autobiographer–and this one is attractively so–it is hard to escape the implication that things are important simply because they happened to you. The life story, then, is not the most promising of forms for an intellectual–not only because it is allergic to ideas but because intellectuals are not renowned for their enthralling lives. We would not find as dull a life as Darwin’s in the least fascinating were it not for what he wrote. For an English intellectual like Hobsbawm, the problem is compounded by the fact that the English are as averse to confessionalism as they are to ideas. Shy, reticent souls that they are, they are not given to producing what Hobsbawm calls "biographies that lift bedclothes," and this one hardly tweaks a sheet. Hobsbawm is properly reserved about his private life, and would be a disastrous flop on The Oprah Winfrey Show. He lets slip the fact that he was briefly and unhappily married to a woman who qualified as a kosher Cockney, being born not only within the sound of Bow bells but actually in the Tower of London; but this, one feels, is motivated more by cultural curiosity than by emotional exhibitionism. He tells us that both of his parents died when he was very young, and that he was raised by an aunt and uncle; yet though this must surely have had a deep emotional impact on his later life, we learn nothing of it. Instead, he breaks the golden rule of the genre and sets his personal life in the context of historical events and ideas, not in the context of his taste in brandy or blondes. As far as ideas go, twentieth-century Britain imported them largely from Central European Jewish émigrés like Hobsbawm himself. Wittgenstein, Namier, Eysenck, Popper, Melanie Klein, Isaac Deutscher, Isaiah Berlin: One can imagine the Neanderthal condition of modern English culture without these brilliant blow-ins and carpetbaggers. Much the same happened in the literary arena, as the heights of "English" literature were effortlessly monopolized by a Pole (Joseph Conrad), three Americans (Henry James, T.S. Eliot and Ezra Pound) and five Irishmen (Shaw, Wilde, Yeats, Joyce and Beckett). The Irish were expected to write most of England’s literature for it, such being the burdens of empire, as well as supplying them over the years with rents, cattle and cannon-fodder. The position of these European exiles was ambiguous, as Perry Anderson has argued. Shuffling among three or four different cultures, they had a cosmopolitan flair and range that put the parochialism of the British to shame. Because they were mostly refugees from political tyranny and turmoil at the heart of Europe, their work was infused with a passion and urgency that the natives found hard to match. Yet refugees do not commonly rock the life-raft they are clambering aboard. If they view the sedateness of the native culture with a skeptical eye, they can also be grateful for it. It is an ambiguity well illustrated by this memoir. Born in Alexandria eighty-six years ago, the son of a literary Austrian mother and the offspring of a London working-class family, Eric Hobsbawm was brought up in Vienna, moved to Berlin as a schoolboy while Hitler was scrambling into the Reichstag, and in 1933 fled from there to London, where, astonishingly, he won a scholarship to Cambridge only two years later. He has lived and worked in London ever since. He was not, he insists, a refugee, having arrived in England as a British subject; but he is certainly a citizen of the world, who knew as a young man how to keep enough money about his person for a speedy departure, and who is still conscious that it is possible to feel not quite at home absolutely anywhere. His parents, with suitably internationalist symbolism, were married in a Zurich inhabited at the time by Lenin, James Joyce and the Dadaists. A polyglot Englishman in Vienna and Berlin, a Jewish immigrant in Britain and a maverick among Communists, Hobsbawm is today almost as much at home in France, Italy and Latin America as he is in Hyde Park. For more than half a century now he has been circling the globe from Santiago to Seoul, teaching, arguing, investigating and befriending in a pentecostal babble of tongues. He has knocked around with Cuban revolutionaries and Chilean novelists, New York jazz musicians and San Francisco bohemians, in the global intellectual village that stretches from Lima to Mysore. Visiting the United States has not always been as simple for him as dropping in on La Paz or acting as an informal translator for Che Guevara in Havana, since the US government, as internationally minded as ever, made him apply for a special visa each time he taught there. He was, one might claim, mightily lucky to get through JFK at all, considering that Iris Murdoch was kept out of the United States for years on account of a surreally short sojourn in the British Communist Party. In a coruscating cameo of the 1930s in this book, Hobsbawm portrays a turbulent world of frontier-crossing and meetings in back rooms in Berlin, of refugees and resistance fighters, Yugoslav partisans and death camp survivors, louche poets and secret agents, courageous Communists and squalid betrayals. If he was never a Zionist, without a shred of emotional attachment to "the small, militarist, culturally disappointing and politically aggressive nation-state which asks for my solidarity on racial grounds," it is not only because emancipated middle-class Viennese Jews of his generation rarely were; it is also because his life has bred in him a deep-seated aversion to all brands of ethnic particularism. He is uneasy with new history-writing centered on gender, ethnicity and the like, and has made some notoriously negative comments about Third World revolutionary nationalism, sometimes of an unpleasantly de haut en bas kind. Nationalism for him meant Hitler, not Ho Chi Minh. Hobsbawm has been a lifelong Communist, having first joined a Communist organization as a Berlin schoolboy and later hitching up with the party as a student at Cambridge. A good many political leftists in Britain, from the Soviet spy Kim Philby to Tariq Ali and Perry Anderson, have hailed from a cosmopolitan background–often, as with all three of these figures, as a result of empire. (Hobsbawm knew some of the notorious English Soviet spies at Cambridge, and tells us that he would most certainly have become one himself had he been invited. He did, however, lack that vital prerequisite for membership in the British Intelligence Service, an ability to complete the London Times crossword puzzle with preternatural speed.) Unlike many of his émigré colleagues, and to his perpetual credit, he did not indulge in the venerable expatriate game of becoming more English than the English, appropriating the Tory politics of the natives along with their plummy accents. On the contrary, he perversely remained a member of the Communist Party long after others had abandoned it in disgust. He has been, even so, an English Communist, and English Communists are in one sense as much a part of the Establishment as the House of Lords. This, then, is the more sedate, traditionalist side of the citizen of the world. In Hobsbawm’s day, a good number of prominent English Communists were donnish, patrician figures who combined an interest in dialectics with a passion for collecting Victorian bric-a-brac. It is not entirely surprising that Hobsbawm once met with a Chinese guerrilla leader in the Atheneum, one of the stuffiest of London’s upper-class clubs. He describes himself in this memoir as "an accepted member of the official British cultural establishment"; and although he is suitably enjoying life quite as robustly as he does, he also clearly feels the pleasure of someone taken in from the cold. In fact, he discreetly plays down the degree to which he is a paid-up member of the London literary set, a kind of latter-day Bloomsbury sage in the tradition of Bertrand Russell. He has never, he confesses, been much of a political activist, being temperamentally more preoccupied with books and birds. Like several members of the pioneering Communist Historians Group, to which he belonged, he came to history from an interest in the literary arts, and it still shows in the stylish, subdued elegance of his prose. E.P. Thompson also started out as a literary student. But literary types are rarely the most eager to get out of bed in order to go leafleting. Indeed, it is hard not to suspect that one reason Hobsbawm lingered so unseasonably in the Communist Party after Hungary and the Prague Spring was because, by that time at least, it didn’t really mean much more to him than lingering in the pub. Hobsbawm arrived at Cambridge University’s King’s College in the halcyon days of Noel Annan, Maynard Keynes and E.M. Forster, and clearly flourished there. He actually took Forster to a performance by Lenny Bruce, an encounter of which one would dearly love to have the transcript. There were still plenty of Darwins, Ricardos, Huxleys and Stracheys among the undergraduates; but though Hobsbawm came, unusually, from a lowly grammar school rather than a posh private school, he was elected a member of the celebrated Apostles’ Club, which numbered Tennyson, Russell and Wittgenstein among its former luminaries. The émigré Jewish leftist Hobsbawm was not entirely bedazzled by Cambridge; in a masterly little pen-portrait of the then-provost of King’s, he sketches the malice and bitchery "behind the mask of camp senile benevolence." Even so, he had arrived among the English upper-middle classes, and was never to betray any particular discomfort in this suave, soft-toned company. The Communist Party that Hobsbawm joined in the 1930s was the kind of outfit in which you would abandon your spouse if the Central Committee instructed you to. Indeed, Hobsbawm realized that he was no longer a pukka Communist when he was able to contemplate having a sexual relationship with someone who was not a potential party recruit, a feeling one might still find today among recovering Mormons or repentant Jehovah’s Witnesses. He seems to have had few illusions about Stalinism from the outset, while apparently feeling few qualms about belonging to a Stalinist party whose record was littered with sordid betrayals of working-class militancy. Like most of his political tendency and generation, he was mostly bemused by 1968, though open-mindedly so. It was his passion for jazz that lent him a touch more sympathy for youth subcultures than most of the reactionary old party hacks of the day. He was for ten years the jazz critic of The New Statesman, writing under the pseudonym Francis Newton, in homage to Frankie Newton, a renowned Communist jazz trumpeter of the 1930s. To remain a party member, he tells us, was to stay true to the memory of the October Revolution and the struggle against fascism; but these admirable sentiments were scarcely a monopoly of the CPs. In fact, it was in the name of the October Revolution that a good many socialists fought against what the Communist Party stood for. 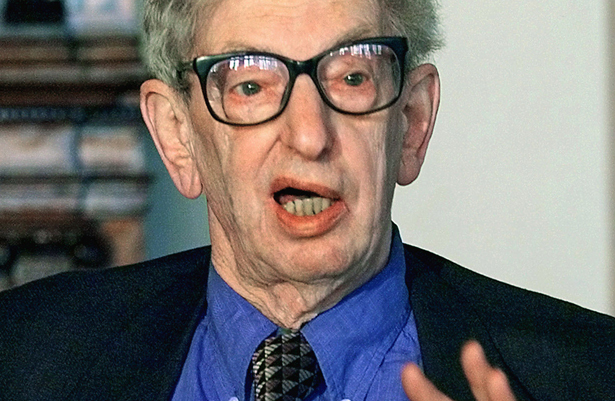 Hobsbawm has been, all along, a Popular Frontist–even as late as the 1980s, when he campaigned against "extreme" leftists in the Labour Party and for an anti-Thatcherite alliance with the Liberals. Inexplicable for a man who lived through the rise of Hitler, he tells us that Labour’s electoral defeat at the hands of Thatcherism was "the saddest and most desperate [moment] of my political experience." He does not add that his own efforts to turn the Labour Party to the political right (hardly the most gargantuan of tasks) finally resulted in the advent of the very Blairism he detests–"Thatcherism in trousers," as he dubs it. Hobsbawm has a good deal to feel gratified about. He is a historian of formidable influence, erudition and stylistic grace; a public figure feted from Bologna to Beijing, yet a man skilled in the subtle arts of personal friendship; a politico who has survived the most bloodstained century known to humanity, yet who has managed to relish his life in the process. He still retains his insatiable energy for parties, debate, travel and ideas. He is one of Aristotle’s "men of virtue"–which is not to say that he is a saint, simply that he has thrived, excelled and exercised his prodigious talents to the full. Or, as he himself puts it in less grandly Aristotelian language, "It has been a lot of fun." Even so, Interesting Times concludes on a sobering note. Hobsbawm is fond of the United States, but glad that he and his children do not live in a society that acknowledges no limits on its willingness to use its strength. The twenty-first century, he observed, "opens on twilight and obscurity." It is greatly to our loss that we shall not have his wisdom to guide us through it.